After careful consideration of project scope, available data and commitment of the different partner organisations (see also previous blog post), the area of interest (AOI) for R2R was updated to its final shape. This updated AOI is the area for which a structural framework model will be built, and to which geomanifestations will be tied, during the lifespan of GeoConnect³d. The image to the right shows the updated AOI in yellow, and areas for which 3D geological models exist in red. 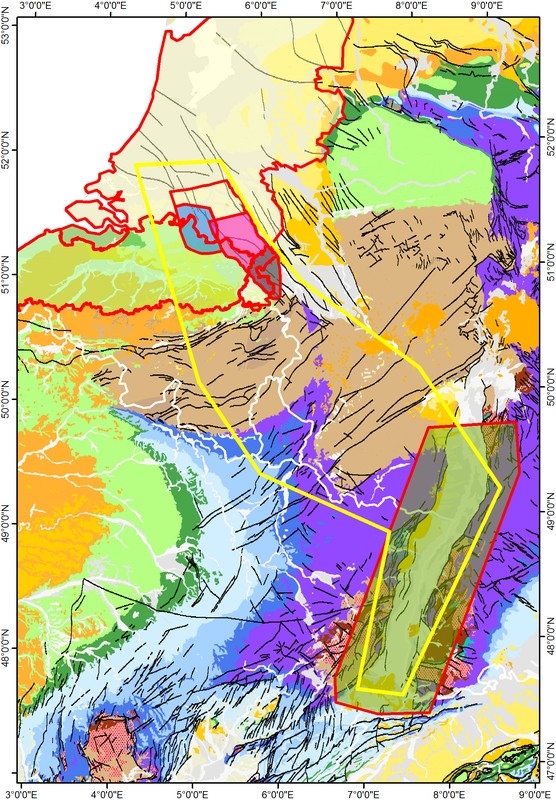 Background image is a geological map from GISEurope_Bedrock_and_Structural_Geology (available here). Time now for developing the Structural Framework Model and to start populating the AOI with Geomanifestations!